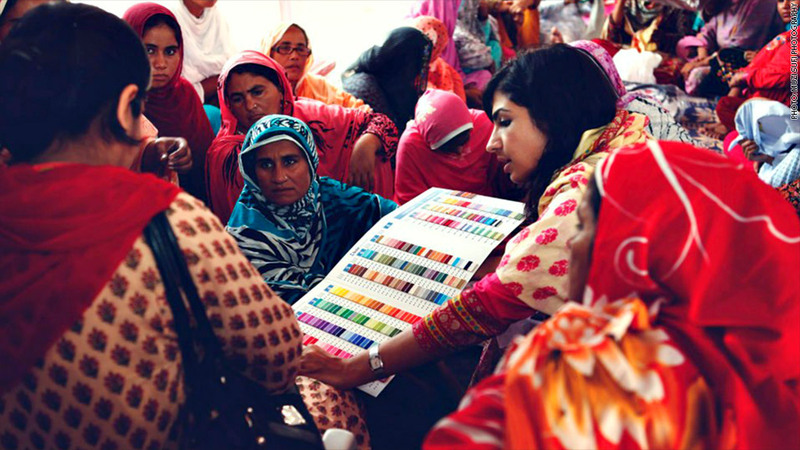 Saba Gul (center) shows swatches to Popinjay's artisans. Popinjay is a high-end handbag company that attracts customers with lush leather and hand-embroidered silk. The designs draw inspiration from Mughal screens, Turkish tiles and Jerusalem's Dome of the Rock. But the Pakistani women who embroider them were once deeply impoverished. The company's mission -- producing fair-wage jobs for these women -- smacks of social consciousness, but wasn't enough to compete in the $9 billion handbag market. About a year ago, when Popinjay was operating as the nonprofit BLISS, it teetered on the brink of collapse. MIT-educated founder Saba Gul had left a six-figure engineering job to launch the nonprofit and create an alternative for Pakistani girls often forced to leave school young and work for a pittance. For Gul, who is Pakistani, it was too sharp a contrast to her own life. In March 2011, with about $20,000 in personal savings and $9,000 in Indiegogo funds, Gul launched BLISS, which offered a living wage to 40 uneducated Punjabi women who otherwise survived on about $2 a day. It was personally fulfilling work for Gul, but by the third quarter of 2012, progress slowed. The venture was unable to launch a new collection, and sales channels were limited. By the fourth quarter, sales stagnated. "I think we were two weeks, maybe three weeks, from running out of money," says Gul. Since BLISS worked directly with the underprivileged, a nonprofit formulation had seemed natural to Gul. But it came with unforeseen complications. "I heavily underestimated the frustrations of raising nonprofit money," says Gul. She had a fast-paced, start-up mentality but faced funding cycles that were a year or two long. Worse, Gul had a difficult time attracting the right team. As a nonprofit, BLISS was unable to convince top-tier professionals to join the early-stage venture at a low pay scale, because equity couldn't be part of the package. In January 2013, Gul began rebranding BLISS as the for-profit Popinjay. Production shifted from Attock to Hafizabad, which had high female unemployment and was closer to Popinjay's Lahore office. It was an identity shift for Gul as well as the company. To salvage the venture, she "went from reading reports on education in Pakistan to reading fashion editorials." The bags took a posh turn with trendy designs and improved quality: finer leather, top-quality hardware and silk instead of cotton. That meant retraining the artisans and tapping high-end suppliers, but it gave Popinjay access to retailers with much larger sales volumes. Gul did her own financials for BLISS, but Popinjay took it to a whole new level. She learned to build reports for investors and walked into board rooms "knowing every cell of Excel spreadsheets and financial projections." For the company's first round of funding, Gul negotiated the terms herself, nearly halving investors' high-end hopes for equity and raising $265,000. Gul says those investors "bring the right amount of pressure to deliver." Because they have a personal stake in the company, their networks became her network. Within ten days of shaking hands, one investor connected Gul with what she considers the best tannery in Pakistan. She's also been able to hire staff suitable for a fashion label. Rather than international development professionals, Gul's staff manages production, marketing, sales and product design. Popinjay officially launched with its first line in October 2013, and in seven weeks of sales, the company's revenue was equal to an entire year as BLISS. Gul says the ultimate measure of success is the women who inspired her in the first place. Popinjay now employs 150 women who earn $2.50-$3 per hour, two to three times what they were making at BLISS. They work three hours a day, but still earn half of what their husbands do working full time. Gul didn't set out to build a retail brand, but she says, "now, I not only want to help the women, I want to create a brand that represents the values of justice and equality and opportunity for underprivileged artisans. I need a successful brand to help them."